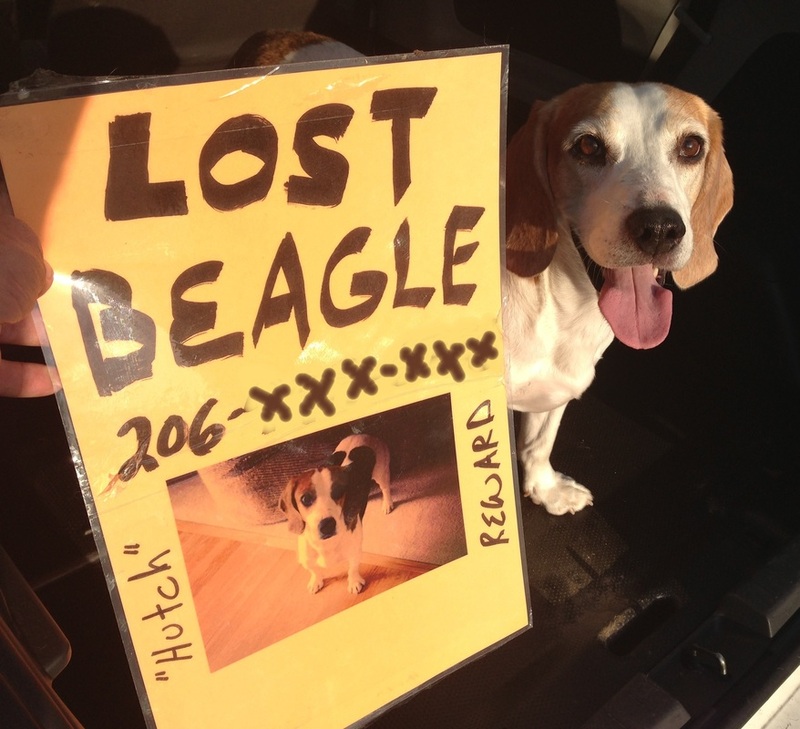 Hutch is a beagle mix, eight years old at the time of his disappearance. Hutch spent the first 3 years of his life in a cage in a research lab. After the research ended, Mark and Susan adopted Hutch. He hikes in the woods near Enumclaw with his family every day. On July 28th, 2013, Susan visited a neighbor’s house with Hutch, unaware of the electric fence. When Hutch tried to greet the goats, he received a shock on his wet nose that sent him running in panic toward highway 410, the main street through Enumclaw. Susan ran after him right away, but Hutch had disappeared. Life stopped for Susan and Mark as they searched for Hutch for twelve to sixteen hours a day for the next twelve days. 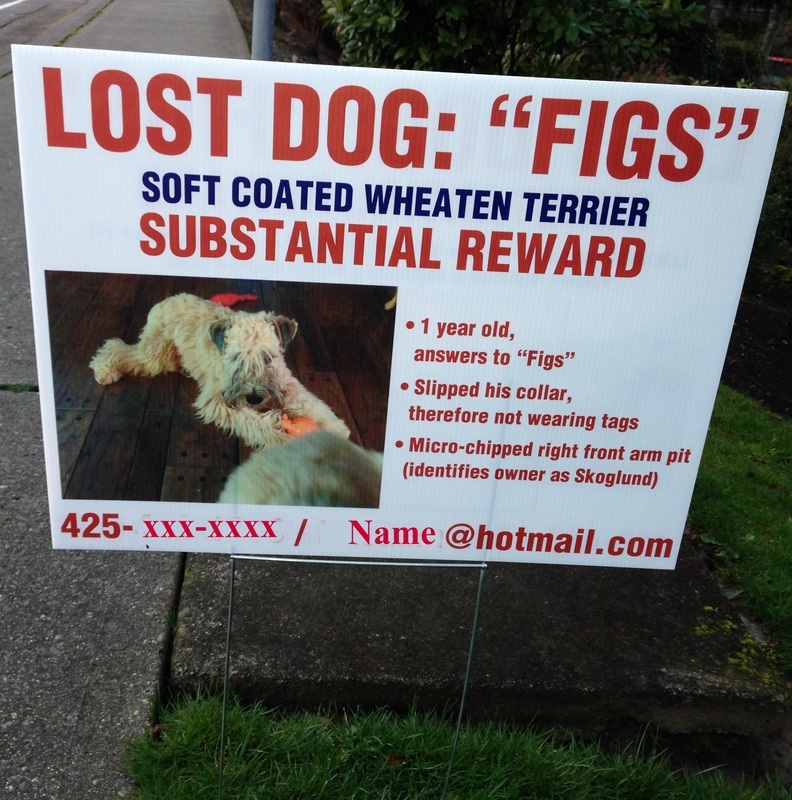 Every telephone pole in Enumclaw seemed to have a poster for Hutch, and Mark and Susan spent many hours each day holding up large neon signs at major intersections, to alert people that Hutch had run away. Because of their signs, they received a sighting five days after the escape, almost two miles west of home. The witness said someone was trying to get Hutch to safety, but he had to leave before seeing if Hutch was successfully captured. Mark and Susan set a humane trap and a wildlife camera near the point last seen, in case Hutch wasn’t picked up. They continued their publicity campaign in case Hutch was picked up by someone. Hutch has a microchip, but he wasn’t wearing a collar at the time of escape. 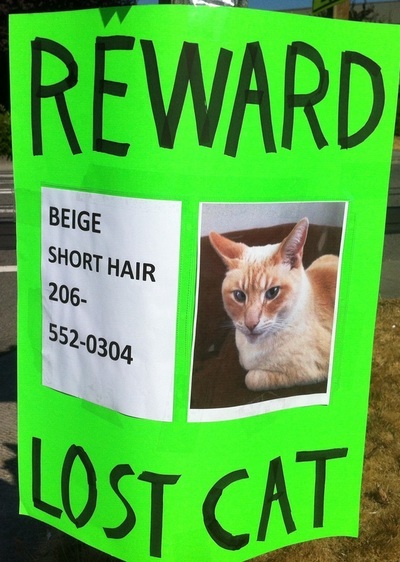 They wanted to make sure that anyone who found Hutch knew where he belonged. On Friday, August 9th, at three in the morning, they started receiving calls of sightings of Hutch on a road less than half a mile east of their home. They received many calls over the next three hours, and each call brought them closer to Hutch. Finally, right as the sun came up, they came upon a police officer pulled over on the side of the road. He pointed ahead of his car, and there was Hutch. Having been advised not to shout his name or make any sudden movements, Mark and Susan approached slowly, with food. They talked softly so that Hutch could hear their voices without feeling pressured. Hutch moved away from them, into a muddy ditch and out again. They could track his movements in the tall grass by watching where the grass moved. Mark approached again and offered food. Hutch didn’t come to Mark right away, but he didn’t run away again. As Hutch took an interest in the food offered, Mark was able to grab him. Once in Mark’s arms, Hutch returned to his old self, acting normal. He had many scrapes and cuts, possibly from barbed wire or an encounter with a critter. He had lost weight, but otherwise he checked out okay at the vet. Now that Hutch is home, Mark and Susan can get back to their lives. Their tireless search for Hutch paid off, as seemingly every person in Enumclaw knew about him and many people actively searched for him. After some rest for all three of them, Hutch will help Mark and Susan go around Enumclaw to take down all the signs. 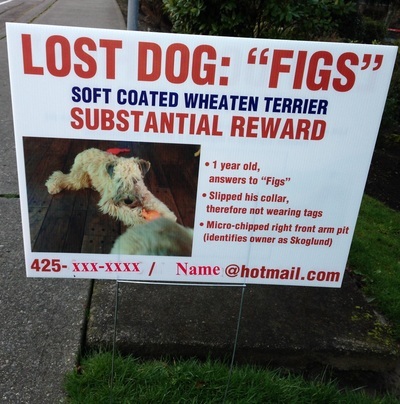 Large, bright signs solve more cases than search dogs can. Search dogs are one effective method of finding your dog under certain circumstances, but search dogs can't be everywhere. Also, there are many situations where a search dog won't be effective, such as if too much time has passed or if the weather is too hot and dry. Signs are relatively cheap, you can put them anywhere at any time, and if done properly, they are your most effective means of finding your dog. 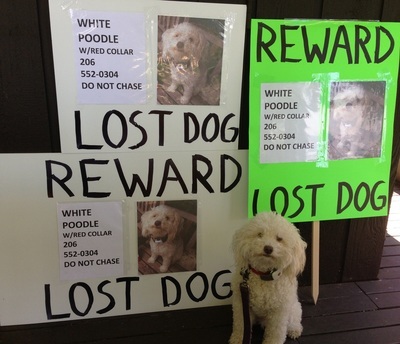 If you want to have the best chance of getting your dog back, you should use all methods at your disposal, including signs and search dogs. If you only have time or money for one thing, do great signs.